This week we decided to do something different and share the top seven selling items of the week. These are the items that everyone seemed to love the most! They are all so good and perfect for this time of year. The number one favorite were these cozy sherpa slippers! These bear slippers are so cute and come in 2 colors. Like a more classic style? These ballerina slippers have the cutest pom poms. This plaid flannel is a slightly heavier flannel and so cozy! It comes in 3 plaid colors and has a pretty gathered back detailing and a slight hi-lo hem which we always love. What would the Holiday Season be without a little shine and sparkle! 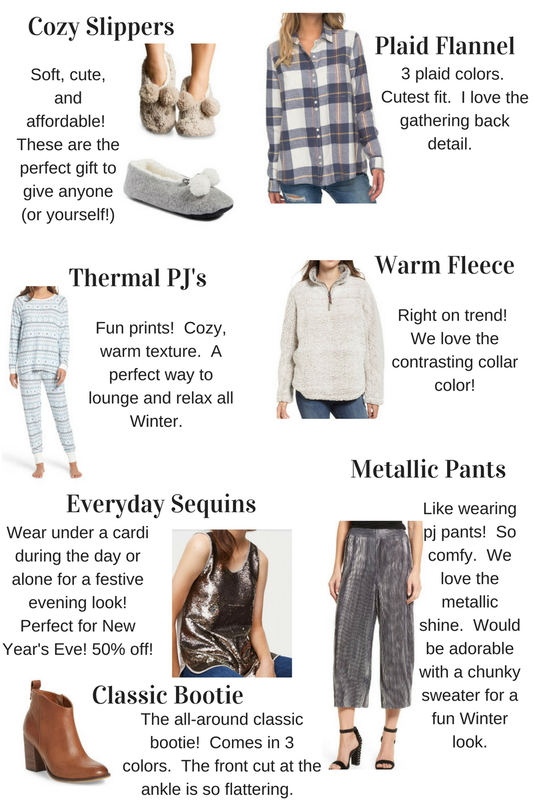 You all loved these metallic pants that Betsy shared as a fun Holiday party look. But these would be so fabulous with a chunky sweater. You can see how she styled these pants in this post. A sequin tank is the perfect layering piece. Adds just the right amount a sparkle.